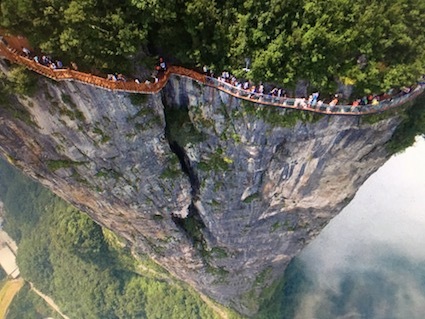 Given my fear of heights the last place I’d ever be found is walking along the latest Chinese tourist attraction – a skywalk in East Taihang province. Perched over a kilometre above sea level the transparent floor is just 3cm thick. Before venturing out every tourist has to decide whether they think the floor will hold their weight, or whether they are more likely to plunge into the valley below. In that respect at least, the skywalk has much in common with Brexit. With just four months to go opinion seems equally divided about what we’ll wake up to on 30th March 2019. Will our economy be crashing to the ground or will it still be holding firm? In an early lesson in discipleship Jesus stood on a lake and invited his friend Peter to get out of a boat and walk towards him across the water. As long as he kept his eyes on Jesus the water stayed firm beneath his feet. But when he looked at the water he started to sink. The point was a simple one – if you keep your eyes fixed on Jesus then no matter what’s going on around you, you’ll be standing on a firm foundation. Worth remembering as the clock ticks down to Brexit!